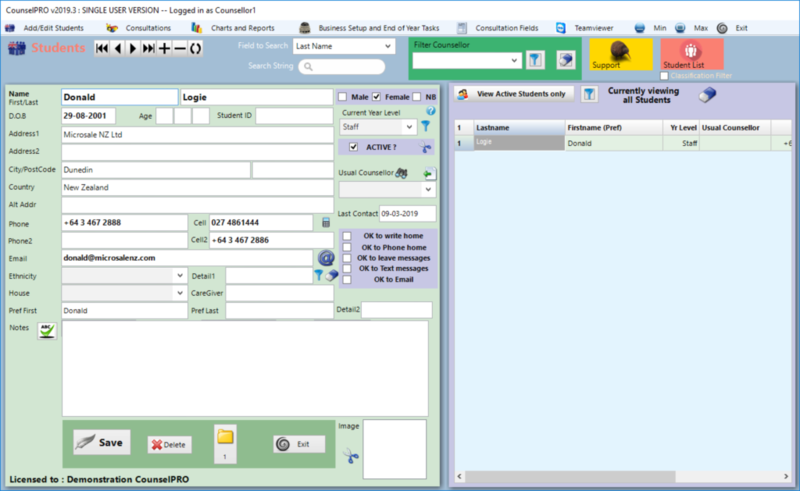 CounselPRO Schools is an information management tool for all school counselling professionals. It is an easy to use, affordable program for recording consultations, managing student information and printing a variety of relevant board and ERO reports. AO Tawhiti Unlimited, Aotea College, Auckland Girls Grammar School, Avonside Girls’ HS, Awatapu College, Baradene College, Bayfield High School, Birkenhead College, Bishop Viard College, Botany Downs Secondary School, Campion College, Carmel College, Christchurch Girls HS, Coastal Taranaki, Cobham Intermediate, Columba College, Covenant Christian School (AUS), Darfield High School, Edgecumbe College, Edgewater College, Ellesmere College, Feilding HS, Fiordland College, Francis Douglas Memorial College, Fraser HS, Glendowie College, Golden Bay HS, Green Bay HS, Hagley College, Hamilton Girls’ HS, Hamilton Boys HS, Hastings Girls’ HS, Hobsonville Point Secondary School, Howick College, Hutt Valley HS, Iona College (Aus), Inglewood HS, James Cook HS, John Paul II HS, Kaiapoi HS, Kaikoura HS, Karamu HS, Karanaga Mai Young Parents College, Karamu HS, Kavanagh College, Kings College, Kuranui College, Long Bay College, Macleans College, Mairehau HS, Makoura College, Manukau Institute of Technology, Middleton Grange HS, Motueka HS, Mountainview HS, Naenae College, Napier Girls’ HS, New Plymouth Boys’ HS,New Plymouth Girls’ HS, Nga Tawa Diocesan School, One Tree Hill College, Onehunga HS, Orewa College, Otago Girls HS, Otahuhu College, Palmerston North Girls HS, Papanui HS, Pukekohe HS, Queen Elizabeth College, Queens HS, Rangiatea School, Rangitikei College, Rangitoto College, Raphael House, Rathkeale College, Rolleston College, Rongotai College, Rosehill College, Rotorua Girls HS, Sacred Heart Girls H S, Spotswood College, St Dominics College, St Bernards College, Saint Kentigern, St Mary’s College Wellington, St Marys College – Ponsonby, St Matthews Collegiate, St Pauls Collegiate, St Peters College, Taieri College, Tamaki College, Tarawera HS, Tawa College, Te Kura Kaupapa Maori O te Whanau Tahi, Te Pa O Rakaihautu, Te Roopu O Wai Ora, Trident HS, Upper Hutt College, Villanova College (AUS), Wairarapa College, Waiuku College, Westland HS, Western Springs College, Whakatane HS, Whanganui HS. Used by Counsellors in over 100 Schools in NZ and Australia. One-time setup of consultation types, classifications, Term Names, Year Levels, Houses or Whanau, Other Issues, ethnicity etc. 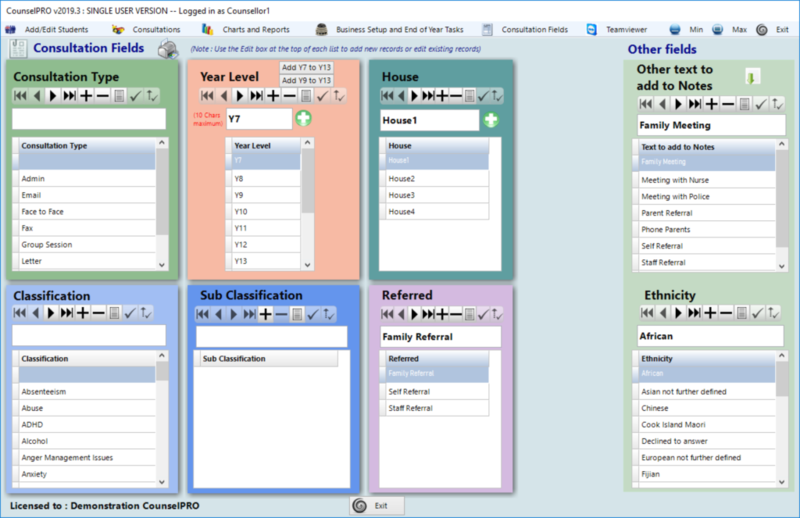 Drop-down boxes allow fast selection during Consultation entry. Reports include Numbers per term and per year, Consultations by Classification, Consultations by Ethnicity, Consultations by Year Level, by Consultation Type etc etc – Adjustable to whatever you have named the fields. Reports and Charts show information for any chosen year and for any dates within the year,based on the criteria you choose. You can even generate a bar chart that compares the last 3 years. All reports are automatically generated in csv format, for loading into a Spreadsheet. You can then produce whatever charts you want of your data. 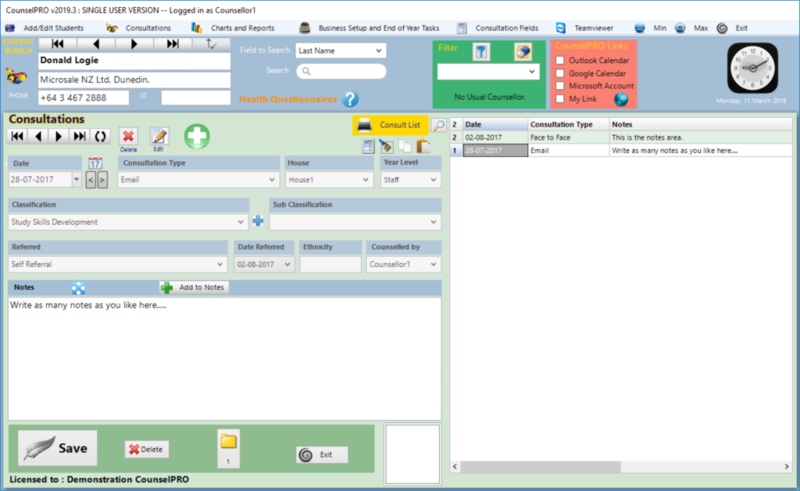 Access Outlook, Google Calendar or Microsoft Account directly from the program for Appointment Diaries. Even set up your own web link to a website of your choice. Price per School : Single User PC Version : NZ$295+GST (A$275 incl GST) Unlimited help and support for first year, then a support and update fee of $150+GST per year (+$25 for additional users to a max of $225+GST) requested for continued support and updates when required. Click here for download instructions……..
Download the MAC trial version by clicking on the button below (it’s a zipped pkg file) and test-drive it today! Note : The pkg (flat distribution file) installation has been designed for mac version 10.7 and above.